We offer free ground shipping on all orders over $150 to any of the Lower 48 contiguous US States. Shipping to other destinations are charged at cost. Prompt shipping is part of our commitment to providing great customer service. Over 90% of our products ship the same day and, where we do not have adequate inventory, we encourage our suppliers to ship quickly. All orders are shipped at cost and include insurance. Typically, we ship via UPS, but please call if you wish to use your own shipping company, Fedex or USPS. Orders must be placed by 3:00pm Eastern Time to ship the same day. There is no weekend shipping service. Therefore, an order placed on a Saturday or Sunday or after 3pm on a Friday does not ship until Monday. Please note that we offer Expedited Shipping to Canada which includes UPS brokerage fees but not local duties or taxes. UPS will request payment of these charges at the time of delivery. You can also pay these charges ahead of time by calling UPS at : (1-800-742-5877). Under UPS’s new e-Tailer Brokerage Program (eBP), any UPS Standard shipment valued under CAD $200 and for non commercial use, will incur a reduced brokerage fee of CAD $10, plus any applicable duties and taxes. Orders valued over CAD $200 will incur graduated fees according to the chart below. 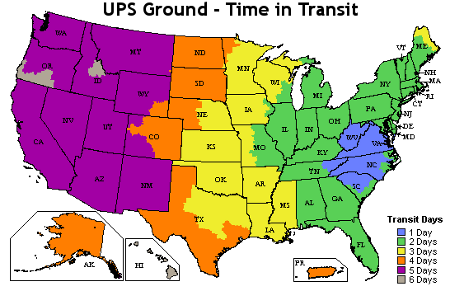 We ship to all countries where UPS or USPS services are available. Please note that all custom and brokerage fees levied on products imported into the country of destination are the responsibility of the recipient. Such fees/duties are NOT included in our pricing. Note: All delivery times are based on information provided by our carriers: UPS, FedEx and the USPS. We cannot be held responsible for shipping delays that may commonly occur with these carriers in their normal course of business.